Stock photo of Woodside National Historic Site, the childhood home of prime minister William Lyon Mackenzie King, Kitchener, Ontario, Canada. Woodside National Historic Site, the childhood home of Canada's William Lyon Mackenzie. 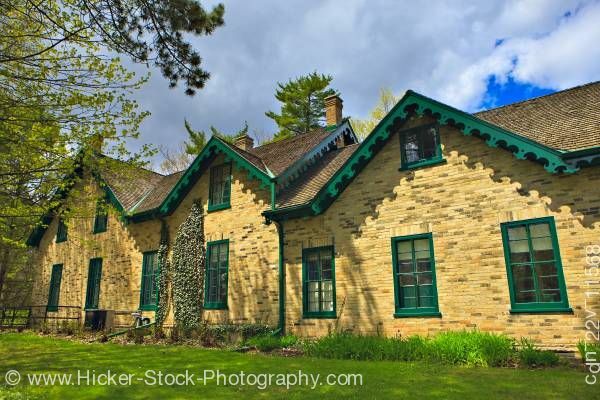 This stock photo shows Woodside National Historic Site, the childhood home of Canada's longest serving prime minister William Lyon Mackenzie King, Kitchener, Ontario, Canada. This beautiful two-story home with it's ornate green trim around the three peaks of the roof, window panes also painted green and several shades of tan in the brick construction. Three chimney stacks are shown on the roof and the shingles of different shades of browns. The lawn is well groomed with bushes and mulch run along the exterior of the home and ivy runs up the walls between two windows. To the left in the foreground and behind the house there are a few tall trees. The sky is full of big puffy white clouds with a touch of blue sky peeking through. Woodside National Historic Site, the childhood home of Canada's longest serving prime minister William Lyon Mackenzie King, Kitchener, Ontario, Canada.